7. Click here to e­mail /cdn-cgi/l/email-pro­tection#204348524953.. The web server used by Christinecollinscounselling.co.uk is located near the city of San Francisco, USA and is run by CloudFlare. This web server runs a few other websites, mostly in the english language. Some websites on this web server are not suitable for minors. 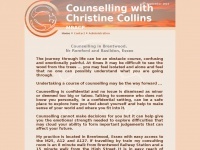 Because Christinecollinscounselling.co.uk was not classified as a website for adults, the proximity to other adult websites could impact the classifcation of this website negatively.